Happy Tuesday everyone. Another T Day has rolled around. :) this is a cold and blustery Tuesday in m neck of the woods and the ground is still a bit white from yesterday's snow. And its my last workday of the week before the long holiday weekend begins. With Thanksgiving in a couple of days, I thought on this T Day I would share something I am thankful for. 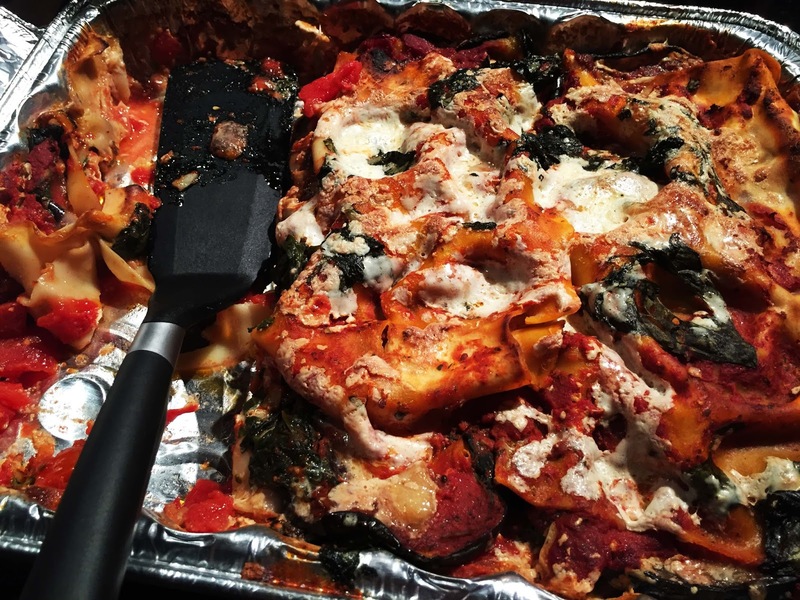 Here's a DELICIOUS veggie lasagna that one of my friends and coworkers made for me (and my family) when my husband came home from the hospital. 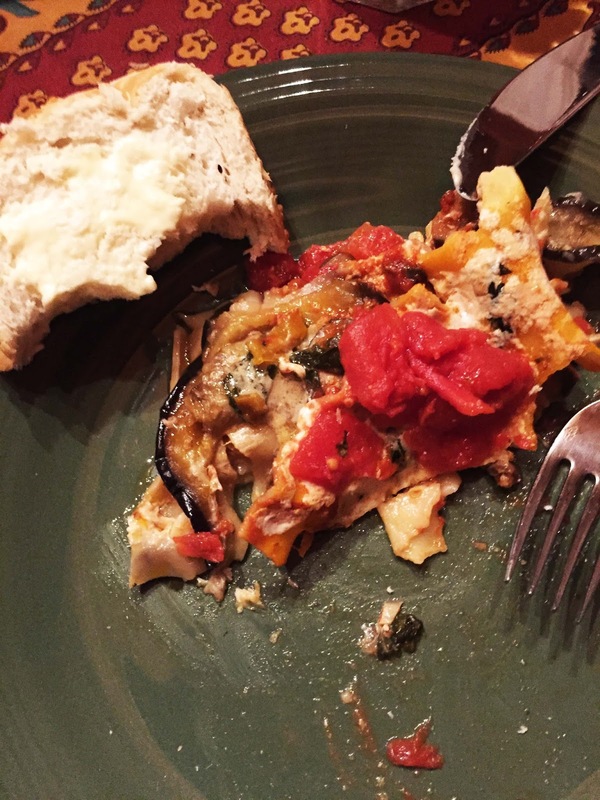 It was made with tomatoes, spinach, eggplant, mushrooms, green peppers and fresh herbs. It was so good I ate it all. You can see my choice of drink with dinner that night was a big glass of cold milk. Such a great sentiment with Thanksgiving coming here in the US in just a couple of days. Stop by Bleubeard and Elizabeth's blog to link up your T Day drink (and food) and be sure to check out what everyone else is enjoying. So I'm tired this morning because yesterday was a pretty CRAZY day. A couple of inches of now melted snow made the roads bad for my commute into work. A tragic car roll over closed down the highway and so myself, along with everyone else, had to drive through one of the cities-right through downtown, and so it ended up taking me 2 hours to get to work (and made me 45 minutes late for the start of school). Then last night the National Honor Society group I advise ran a class competition for scholarships in the names of 3 students who died tragically in previous years here at school. The event was successful, and the parents of these students are always appreciative. I am also thankful to my 2 coworkers who advise with me, and all the awesome students on the NHS board who really are the workers and pulled off this event. So today I am ready to wrap up my classes and start a relaxing long weekend eating turkey! And Happy T day and Happy Thanksgiving (if you celebrate) to those of you who only stop by my blog for T.
Lovely from your co-worker - that lasagna looks fantastic- I would have eaten up all of it as well! Happy Thanksgiving - good that the work week ends so soon an´d you have some days to rest after the annoying driving and that event! what a kind gesture to prepare a meal for you and your family. And it looks delicious-love vegetable lasagne too so I know why you cleaned your plate:) Sounds like the holiday is a perfect time for you to have off from work and relax a bit. Enjoy, and happy T day too! What? You didn't save me some of that lasagna? It looks absolutely wonderful and meatless is even better. Your post shows you have a lot to be thankful for, and melted snow is actually one of them. Hope you have a fun, safe, family oriented Thanksgiving. 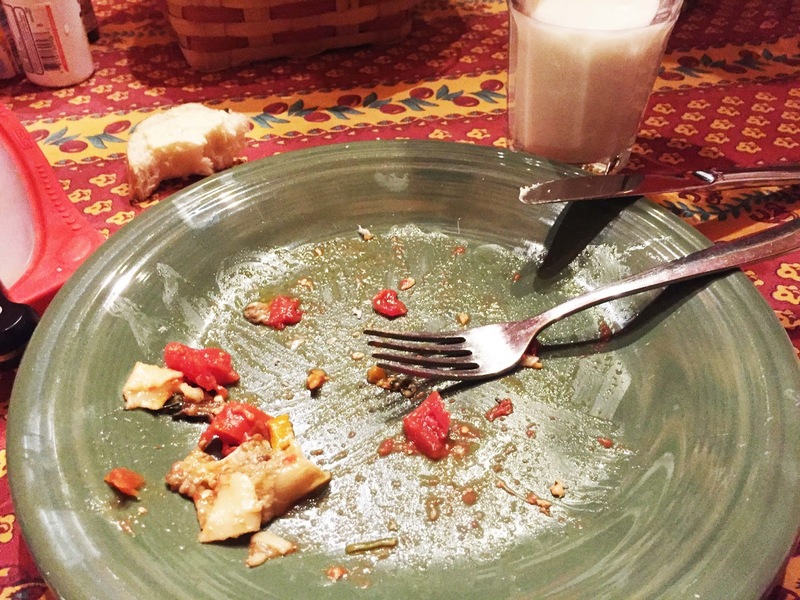 Thanks for sharing your lasagna and milk with us for T this Tuesday. I want that recipe! I think I'd add black olives and fresh basil to mine. your veggie lasagna Looks so tasty, i´m sure i would like to eat one. have a beautiful Long Weekend to enjoy and relax - starting with happy t-day! My mouth is watering looking at your lasagna. It looks delicious! I wonder if we'll ever have snow again. Right now it's partly cloudy and 65F lol I hope you have a nice break and a Happy Thanksgiving. Happy T Tuesday! What a wonderful thing to receive. Good food when you are busy caring for your husband and have no time to cook. That lasagna looks really tasty. I would gladly eat that although it is vegetarian. I wish you and hubs a very relaxing thanksgiving weekend. It looks a delicious vegetarian lasagna. Friends like those who help us, in small or practical ways, are friends last mean a lot to us. That lasagna looks so good!!!! I love both traditional and "veggie" lasagna ♥♥♥♥ The kindness of friends is always so heart warming. What a frustrating ride to work! I hate driving in bad weather....in fact I have almost reached the point of hating driving period :( Not good when you live in the country. Happy Thanksgiving !!! oh how delicious looking! sorry to hear your husband was hospitalized. Sending good thoughts for strength and healing! Happy Autumn! It sounds like an emotional week, Erika. Sending you many happy Thanksgiving wishes and thanks to you for your visits, comments and blog friendship. the lasagna looks delish...thank goodness for friends who help out in such a kind way! Hope your husband is growing stronger every day. Happy Thanksgiving! We say here that Kindness generates kindness. If your colleagues and friends were so supportive , it's because you deserve it and you can be sure that such a kind gesture happened because you are kind too, my friend.In a world devoid of warm feelings, kindness and gratitude are like gold.Love your lasagna. Superb!Hope your husband is doing well.Much Love!